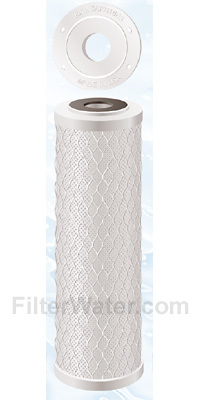 KX Matrikx CTO Carbon Filter # 32-250-125-975 is one of the most common carbon filters on the market. Cartridge fits most standard 10"x2.5" filter housings. NSF certified to reduce Chlorine Taste and Odor. Also known in the industry as "The Workhorse", old product number KX Matrikx CTO/2. Matrikx CTO carbon filter part number 32-250-125-975 removes chlorine, taste and odor, and organic chemicals that contribute to bad taste and odor. Filter also provides dirt holding capacity of a 5-micron sediment filter. CTO Chlorine, Taste and Odor removal filters work great where both carbon and sediment filters are needed. Offers exceptional cost to performance value. The carbon extrusion manufacturing process allows the production of carbon block with more carbon, and lower pressure drop. KX Industries 32-250-125-975 filters are also used in filtering organic solvents. 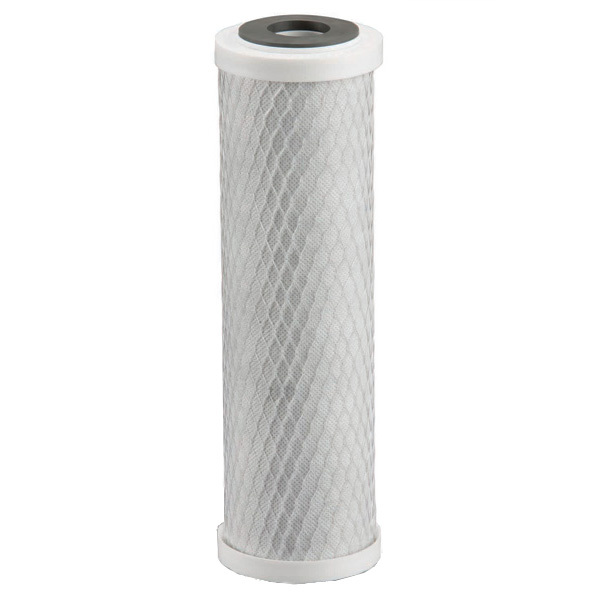 This carbon filter is manufactured from high purity acid washed activated carbon. It is ideal for use in residential and commercial water purification systems, food service, and as pre- and post- filter in Reverse Osmosis systems. The MATRIKX CTO WATER FILTER is Tested and Certified by NSF International under NSF/ANSI Standard 42 for material requirements only. Old product numbers: CT250125100A001 (made in Singapore), KX Matrikx CTO/2 ( CTO2 ). CQ-R5 and many similar 5 micron carbon block filters. Also fits other filter housings that take a standard size 10"x2.5" cartridge. KX Matrikx CTO and CTO2 filters should be changed every 3 to 6 months. Pentek EP-10 and CQ-R5 Carbon Block can be used in place of KX Matrikx CTO with similar performance.